It's a beautiful song and much better performed live than the studio version. I can't post the link yet because I'm still a newbie. You can already post youtube links. It says I need to have 15 posts or more before I can post URLs. Yes. URLs. But you already can post youtube videos using the youtube tag. 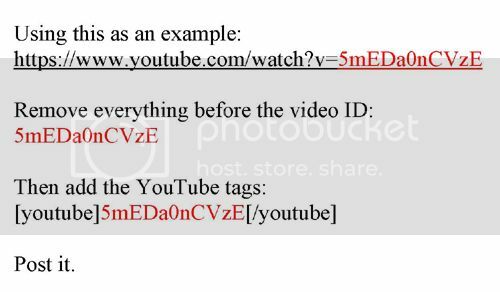 Cause an embedded Youtube video is not a link. Just follow the instructions in the picture above. You added a 9 at the end of the thing for some reason, so the video was all white screen. This is what it should look like.